How do you profitably invest in sustainable agriculture – farms producing diverse, fairly-priced healthy food without harming the environment, but which also restore soil fertility and provide farmers with a fair living? Small farms and community supported agriculture partnerships are nice, but they are predicted in the best-case scenario to reach only 1% to 2% of the population. Farmland LP, a San Francisco-based fund and farmland manager pursues this goal by converting conventional mid-size farms to multi-crop “beyond organic” properties that use a closed-loop, where everything on the farm stays there, a process that reintegrates livestock, also making the system sustainable. Its newfangled approach moves specialist farmers around the property based on ecology, biodiversity and what’s best for the land in the long run. It has five farms totalling 6,750 acres worth $50m under management east of San Francisco and in Oregon’s Willamette Valley. Managing partner Craig Wichner claims that after the soil is restored, this approach which eliminates the need to grow corn and soy for animal feed produces the same amount of food as conventional agriculture, but is more profitable because input costs are so much lower. While yields on farmland increased 38% since 1989, the cost of inputs used by conventional agriculture – fertiliser, herbicides, pesticides, GMOs and fuel – jumped about 325% during the same timeframe, according to the US Department of Agriculture’s Economic Research Service. The five year-old firm has launched its second fund, a $250m private real estate investment trust, or REIT, open to institutional investors and high net worth individuals. 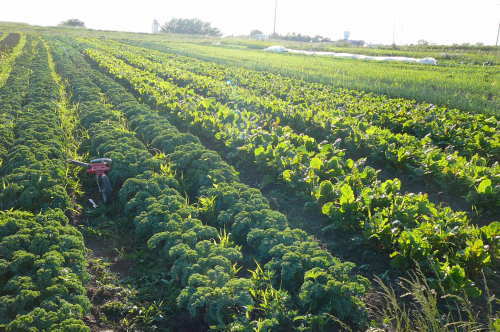 Wichner plans to hold the land long-term, but pay investors an estimated 6-8% net cash flow after the soil has been certified organic in a three to five year conversion period. Read the full story via Investing in sustainable agriculture by converting farms to beyond organic | Guardian Sustainable Business | The Guardian. ⇐ Does Fracking Threaten Future of Ohio Organic Farms?